What started off as a breeding ground for indie titles now seems to be the only form of submission to the digital distribution service, Steam. This is a bold move by Valve as it means not only the bedroom developers but also the big hitters will have to submit their game to Greenlight. Halo 4 earned $220 million on the day it launched. This isn’t quite as much as Halo 3 or reach but it is still an impressive figure. Microsoft reckons its juggernaut franchise is on track to hit its $300 million global sales target within its first week, thrusting lifetime sales for the Halo franchise passed the $3.38 billion mark. Of course the other big release lately is Call Of Duty: Black Ops 2. The game is Amazon’s most preordered game ever beating last year’s Modern Warfare 3. Amazon said it “shattered” the previous record. The company wouldn’t reveal any further details on the launch or preorders of Black Ops 2. Valve president Gabe Newell has has revealed Valve is working on a next generation successor to the Source Engine. Newell also confirmed the Source 2 engine would be completely new, instead of just another update for nearly ten year-old tech. Source made its debut in Counter-Strike: Source and Half-Life 2 in 2004. Mass Effect 4 will run on DICE’s Frostbite engine, the latest version of which was used in Battlefield 3. There also seems to be a lot of interest in being able to play as different alien races, similar to the style of Dragon Age:Origins. Bungie has released a trailer for their upcoming Halo: Reach add-on map pack. The Noble Map Pack trailer shows Halo: Reach multiplayer action taking place on the three new maps: Breakpoint, Anchor 9 and Tempest. The three new areas in the Noble Map Pack look like a lot of fun. You can watch the Halo: Reach Noble Map Pack trailer below. 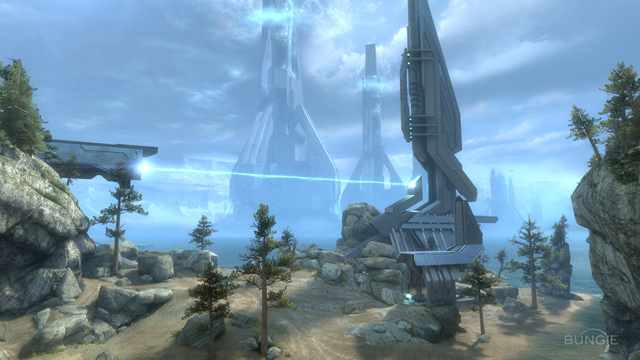 You can find out much more about the new Halo: Reach DLC in this blog about the Noble Map Pack. The Noble Map Pack for Halo: Reach is set to be released on 30th November for 800 Microsoft Points on Xbox Live. 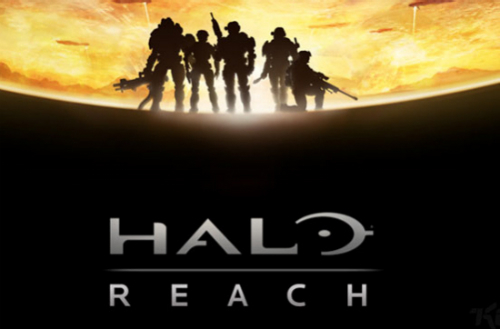 Halo: Reach made $200 million dollars on its first day on sale, and easily topped the charts. Will the release of the Noble Map Pack see a resurgence in the success of Bungie’s shooter? Or will Halo: Reach find itself beaten with the release of Call of Duty: Black Ops? And will you be downloading the new maps? You can leave your thoughts on The Noble Map Pack for Halo: Reach here on the Train2Game blog or on the Train2Game forum. Medal of Honor has topped the UK Charts in its first week, despite the ‘Taliban’ controversy that dogged its journey to release. However, this doesn’t seem to have put gamers off, with the Medal of Honor reboot achieving the biggest ever launch in the series history. 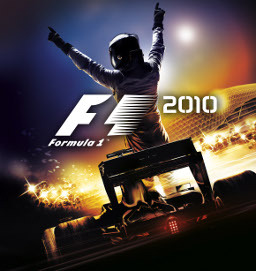 It also achieved what some would see as the impossible byknocking FIFA 11 down to second place in the GFK Chart-Track All Formats Software Chart. FIFA 11 had sold an impressive 2.6 million units worldwide in its first week, and then last weel comfortably held off the challenge of rival PES 2011. 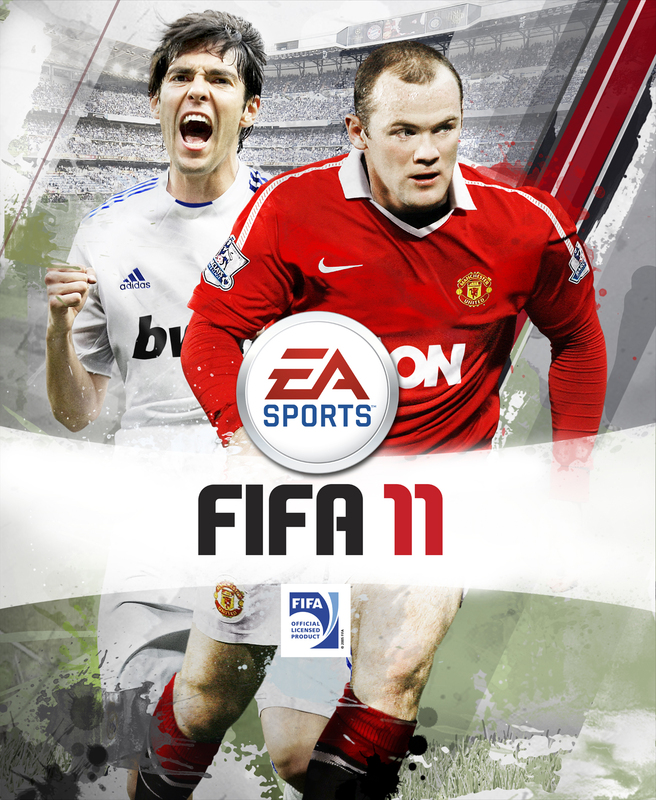 However, it seems that the men with guns in Medal of Honor have proved too strong for FIFA 11. Ubisofts’ Just Dance 2 has made an impressive debut in third place. The original proved to be more of a slow burner, first entering the charts in 30th before going onto strong sales. In fact, Just Dance 1 reappeared in the top ten as recently as last week. Nintendo’s Wii Party has jumped from tenth to fourth place, showing that the more casual titles can still guarantee big bucks. PES 2011 has had a somewhat disappointing week dropping from second to fifth, while F1 2010 also falls two places down the table from fourth to sixth. 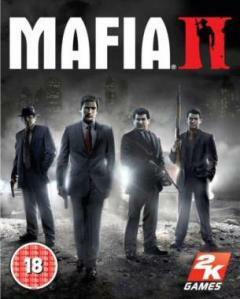 Dead Rising 2 had been in third place in each one of its three weeks in the chart. Unfortunately for Capcom, this feat couldn’t be completed a fourth time with Dead Rising falling down to seventh place. Halo: Reach also continues its steady decline down the UK Chart, dropping to eighth place after topping the charts only one month ago. A third new entry enters the top ten this week with anime title Naruto Shippuden: Ultimate Ninja Storm 2 entering the chart in ninth place. Castlevania: Lord of Shadows completes the top ten, having dropped from its entry position of six. Enslaved: Odyssey to the West drops out of the top ten after just one week, falling to eleventh. This is a shame for Ninja Theory who spent three years developing the game. Meanwhile, the Borderlands Game of the Year edition has entered the top 40 in 35th place. 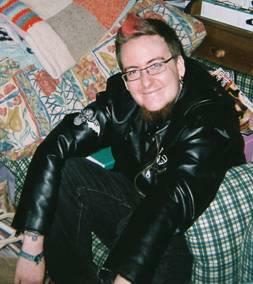 Could the promise of a Duke Nukem Forever demo in future have encouraged sales? So Train2Game, what are your thoughts on the Top 10? What do you think of Medal of Honors’ achievement despite the controversy and mixed reviews? Who is going to own up and say they bought Just Dance 2? And why has Enslaved: Odyssey to the West slumped so quickly? Also, with Fallout: New Vegas released this week, will Medal of Honors’ position on top be short lived? You can leave your thoughts on Medal of Honor, Fallout: New Vegas or any of the above here on the Train2Game blog, or on the Train2Game forum. Microsoft has announced the first DLC pack for Halo Reach. The Halo Reach: Noble Map Pack, will feature three new multiplayer maps. Bungie.net, the official Halo: Reach website states that the Noble Map Pack will be available on Xbox Live and “retail locations” from November 30th at a cost of 800 Microsoft points. The Noble Map Pack will contain all new Achievements worth a total of 250 Gamerscore points. 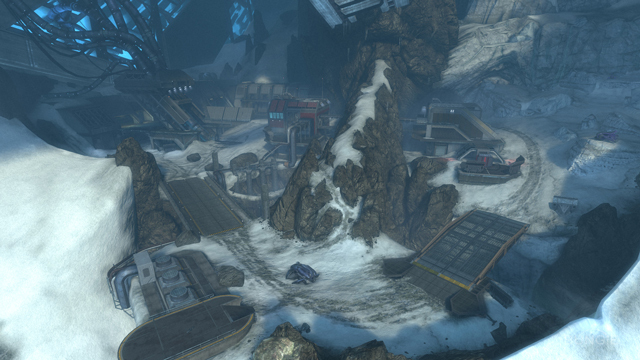 You can see the first pictures of the additions to Halo: Reach from the Noble Map Pack below. “Our DLC team has been hard at work these last few months, cloistered together in the heart of the studio preparing three new multiplayer maps for your Halo: Reach multiplayer pleasure. Though they’re still putting the finishing touches on what we’ve now dubbed the Noble Map Pack as we speak, we’ve been itching like crazy to show off the trio of maps for quite some time now. Today, you get your first good look. The Noble Map Pack will be ready for download on November 30th for 800 Microsoft Points. You can see the descriptions of the new Halo: Reach Noble Map Pack levels below, and get a glimpse of their designs. 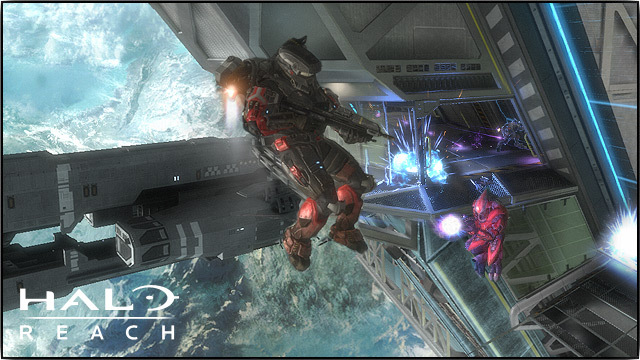 You can see more pictures of the new Noble Map Pack levels on the official Halo: Reach website. Tempest – “Though we may never fully understand these devices, it is not our nature to leave ancient stones unturned.” This abandoned shoreline facility bends both sea and sky to an unnatural purpose, but the ground itself has quickly become another all too familiar battlefield. Though the two opposing symmetrical bases may never reveal their ancient purpose, both now offer makeshift shelter and access to strategic routes perfectly suited for small and large scale skirmishes alike. Tempest supports 8 – 16 players and offers a variety of modes including Free for All, Team Slayer, Team Objective and Big Team Battle. Tempest also provides players with a huge Forge palette, allowing them to create new custom map variants that can be shared with the community-at-large. Anchor 9 – “Orbital dockyards provide rapid refuelling and repairs for a variety of UNSC vessels.” Within the confines of this low orbit dry-dock, UNSC craft undergo rapid repair and rearmament in support of the enduring war effort. 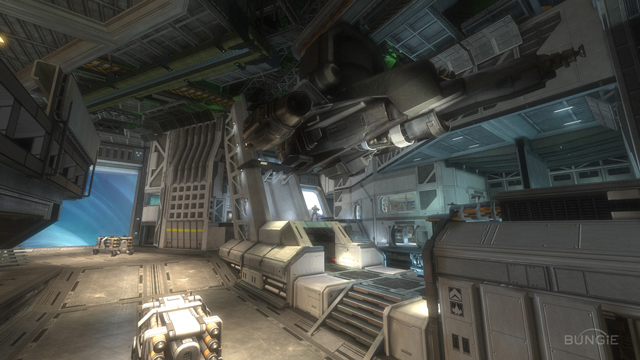 But for the small squads of infantry who now fight over the mirrored interior hallways and open central hangar bay, this platform no longer provides any safe harbour – whether the close quarters combat is occurring inside or out of its artificial gravitational field. Anchor 9 allows 2-8 players to face off in game variants including Free for All, Team Slayer and Team Objective. Breakpoint – “ONI officials believe the data buried within this artefact is key to our survival.” Atop this icy precipice, the Invasion continues. These modular archaeological labs were never intended to withstand such a large-scale onslaught of Covenant military power, but the information being extracted here may prove vital to humanity’s survival. In response to the imminent Covenant threat, UNSC ground and air assets have been deployed to bolster entrenched Spartan countermeasures. This dig site must yield salvation, or it will become a grave. Breakpoint offers multiplayer mayhem for 8-16 players, and supports the Invasion and Big Team Battle game variants. Halo: Reach made $200 million dollars on its first day on sale, and easily topped the charts. So Train2Game, do you think the Noble Map Pack will bring Microsoft even more Halo: Reach success? Will you be investing in the new maps? Or do you think the maps featured in the Noble Pack should have just been included with Halo: Reach on release? Leave your thoughts here on the Train2Game blog, or on the Train2Game forum. Halo: Reach has become the most successful entertainment launch of the year, according to Microsoft. The company say that the Xbox 360 exclusive Halo: Reach made $200 million in just its first day on sale. The launch of Halo: Reach on September 13th saw fans worldwide queuing up at midnight launches to be among the first to get their hands on a copy of the game. Microsoft say that the launch of Halo: Reach eclipsed the whole three-day opening weekends this years biggest films including Toy Story 3 and Iron Man 2. Meanwhile, Chart Track have released figures that show Halo: Reach sold 330,000 copies here in the UK during its first day on sale. That already makes Halo: Reach number ten in the list of all-time best-ever weekly sales for an individual title in the UK, and of course there’s still six more days to add to the stats. Of course, Microsoft will have expected Halo: Reach to be a massive success, giving the popularity of the Xbox 360 exclusive series, and the sheer amount of marketing behind it. Whatever the reason behind the success of Halo: Reach, it’s good news for the games industry which has seen the market slump to pre-Nintendo Wii levels. This is excellent news for the video games and interactive entertainment industry, demonstrating how games sales continue to increase despite difficult economic circumstances. So Train2Game, what do you think of the success of Halo: Reach? Is it well deserved? Will Halo: Reach hold onto the title of biggest entertainment launch of the year? Or will a certain Call of Duty: Black Ops’ be the new champion after its release on November 9th? You can leave your thoughts about Halo: Reach here on the Train2Game blog, or on the Train2Game forum. Stores across the world opened at midnight last night to celebrate the launch of the much anticipated Halo: Reach. Here in the UK, hundreds of people queued up in the early hours to be some of the first to get there hands on Halo: Reach, the latest game in Bungie’s highly successful series. 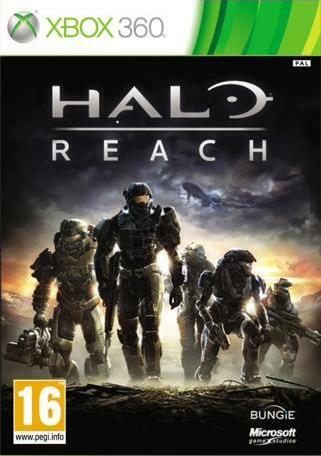 Halo: Reach is the fourth instalment of the Xbox exclusive shooter, and comes three years after the release of Halo 3. However, Halo: Reach is not a sequel but rather prequel to the previous instalments of the Halo franchise. Meanwhile, Editor of GameSpot UK Guy Cocker told the BBC that Halo: Reach is “quite a big deal” and is by far the game that Xbox 360 owners are most excited about right now. “In comparison to Halo 3 though, I’m not sure how well it will go down. Halo: Reach certainly has had a great critical reception with its current score of 92% on Metacritic. Halo fans may have only been playing Halo: Reach for a matter of hours, but already Bungie have had reports of cheaters. The developers say that they’re ready to ban any Halo: Reach players caught cheating. The Halo: Reach midnight launches echo similar events for the release of Starcraft II: Wings of Liberty earlier this year. 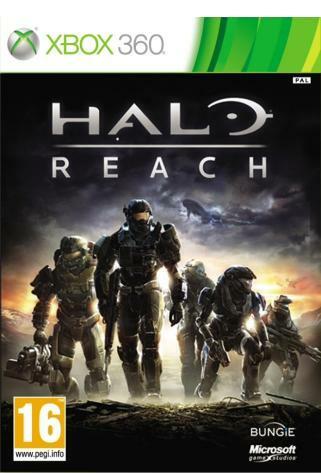 So have any Train2Game students got your hands on a copy of Halo: Reach yet? Perhaps you attended a Halo: Reach midnight launch event? If you don’t own an Xbox 360, do you think the release of Halo: Reach could encourage you to do so? And have you spotted any cheaters yet? You can leave your thoughts on Halo: Reach here on the Train2Game blog, or on the Train2Game forum.